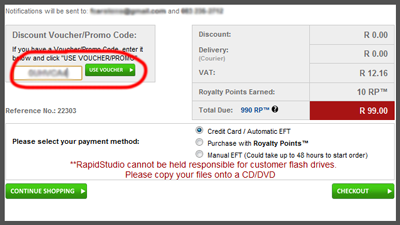 In response to a question asked on our Facebook Wall, I have written a short tutorial on how to redeem your discount voucher with RapidStudio. Using a Gift Voucher or Promo Code works exactly the same. Step 1: Add a photo product to your shopping cart by ordering it through the software or via the website. 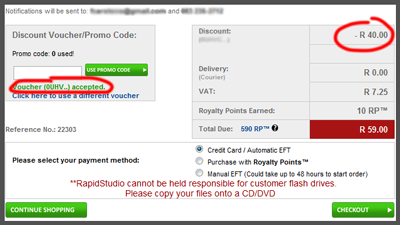 Step 2: In the shopping cart there is a "Discount Voucher / Promo Code" box. Enter your voucher number or promo code into this box and click the "Use Voucher" or "Use Promo Code" button. Below the box where you've entered the number you will see a message: "Voucher (XXXX..) accepted." or "Voucher (XXXX..) has expired" or "Voucher (XXXX..) is invalid". If the voucher is valid, your discount will reflect on the right within the shopping cart totals. If your voucher has expired, whether it can be renewed or not will depend on what type of voucher it is. If you have won the voucher in a competition, the voucher cannot be extended. If it is a Promo Code and the promotion has ended, the Promo Code cannot be extended. If you have purchased the voucher at an Expo or online, you may contact the support call centre and they will assist you in extending your voucher. If the voucher is invalid, the main cause is that the letter "o" and number "0" or the letter "i" and number "1" get confused with each other. Try replacing the letters with numbers and vice versa and try again. Note: Some Promo Codes only work on specific products. ie. a Promo Code for a 2-for-1 special on Hard Cover Photo Books will give you no discount on a shopping cart that has no Hard Cover Photo Book in it. Is it safe to pay with my Credit Card online?